I decided on a trip down to the north wall of the Tweed River. This spot is another one that only really seems to fire for me on dawn or dusk, so it was another early start. I walked out along the north wall just after first light at about 4.15 am. It was another warm morning with virtually no breeze and a cloudy sky. Low tide would be at about 4.30am (QLD Time). I was using the Daiwa Demon Blood rod (2.4m) with a Stradic 800 reel, 30lb braid and a 30lb fluorocarbon leader. I started by casting big soft plastics on 3/8th 3/0 jigheads, all around the end of the rock wall. This produced nothing so I switched to a 110mm Popper – nothing again. I put on a 75g slug – nothing. 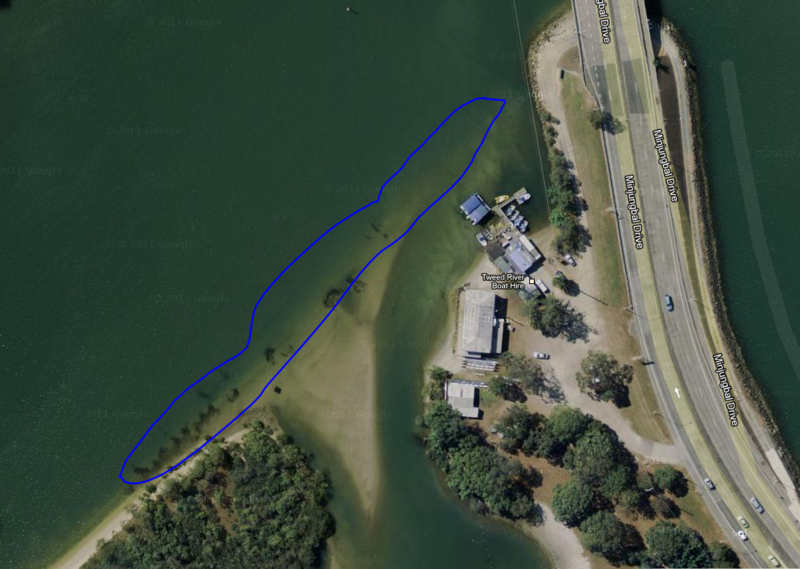 I tried a few hard bodied shallow running minnows – also nothing. By 6.30 am, the sun was beating down and it felt like lunchtime. I decided to swap locations and techniques; put on the waders and try to find some fish in the Tweed River. 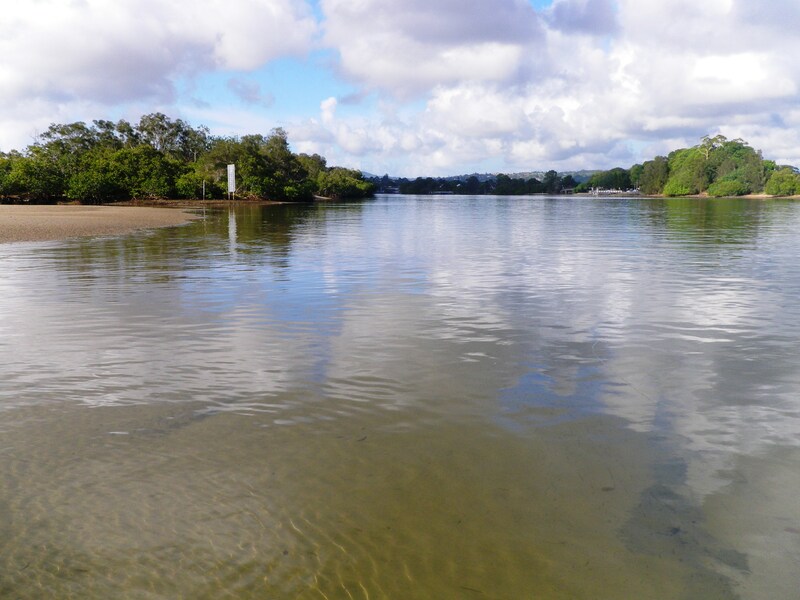 I drove down to the Tweed Heads Rowing Club and parked beside the boat hire place, just by the bridge. I wanted to fish the sand banks and weed beds around the north end of Boyds Island. You can wade out to this area, for a few hours, either side of low tide. 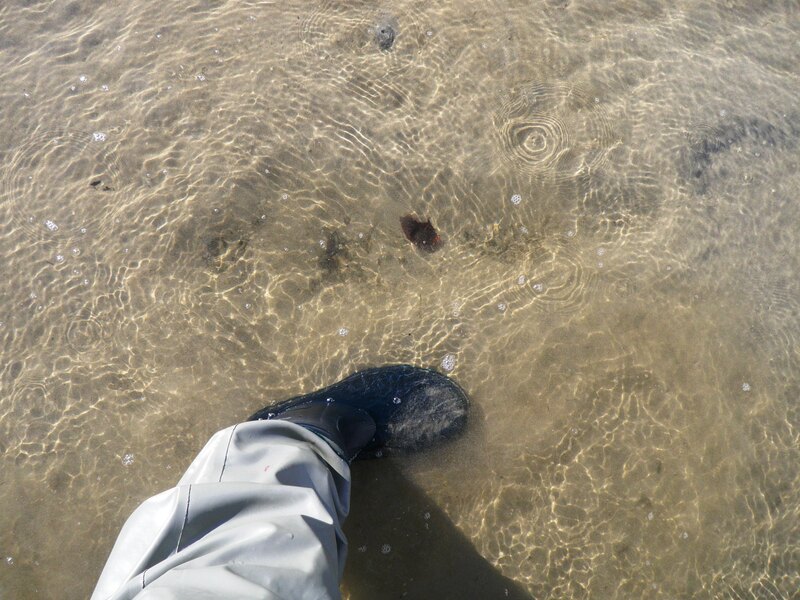 The rest of the time the creek mouth gets too deep to cross – so keep an eye on the tide. 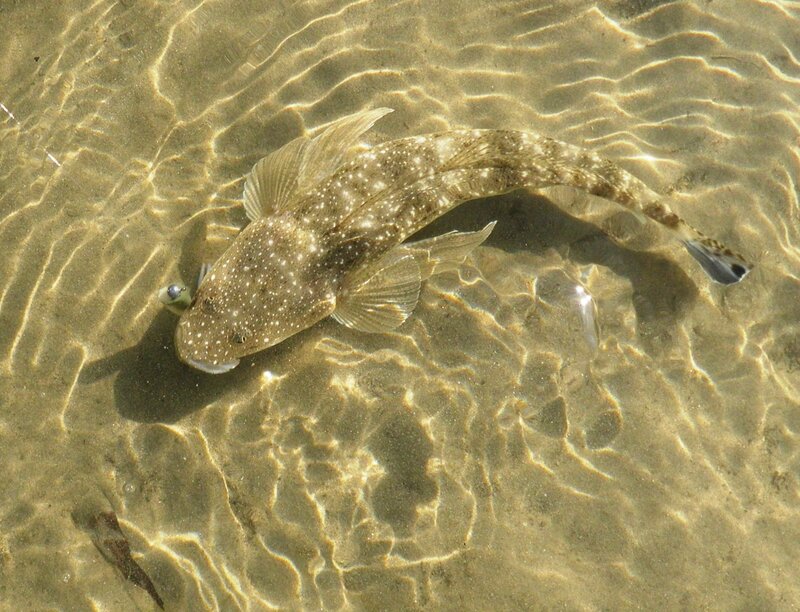 Even with less than a metre of water in the creek mouth there were plenty of small Flathead hanging around. I was back down to my light spin rod – the Loomis GL2 with a Shimano Stradic 3000 reel, 8lb braid and about 1.5 metres of 10lb fluorocarbon, for a leader. I started with a GULP 4” Minnow soft plastic lure in the Pearl Watermelon colour, on a 1/8th 1/0 jighead. On the first cast I felt a grab but there was no hook up. I slowed it all down and pulled the plastic back past the same spot. This time I felt the bite and paused. A few moments later, as I struck, I saw the white belly of the Flathead roll over under the water but it wasn’t hooked. I moved south west across the mouth of the creek to the weed banks which were now under about 60cm of water. Over the next hour I caught 11 Flathead from the edges of the weed banks. Unfortunately not one of them was big enough to keep. I move slowly along the shore, casting just over the edge into the main channel and letting the lure pause, in close to the weed. I decided to try something different and put on one of the DUO lures – which I have been sent to try out by the manufacturers in Japan. They are beautifully crafted and so far they have proved deadly on the Flathead. I tied on a DUO Tetraworks Yurameki – a small bibless sinking pencil lure that weighs about 7 grams and is just under 5 cm long. I had the Redhead colour. 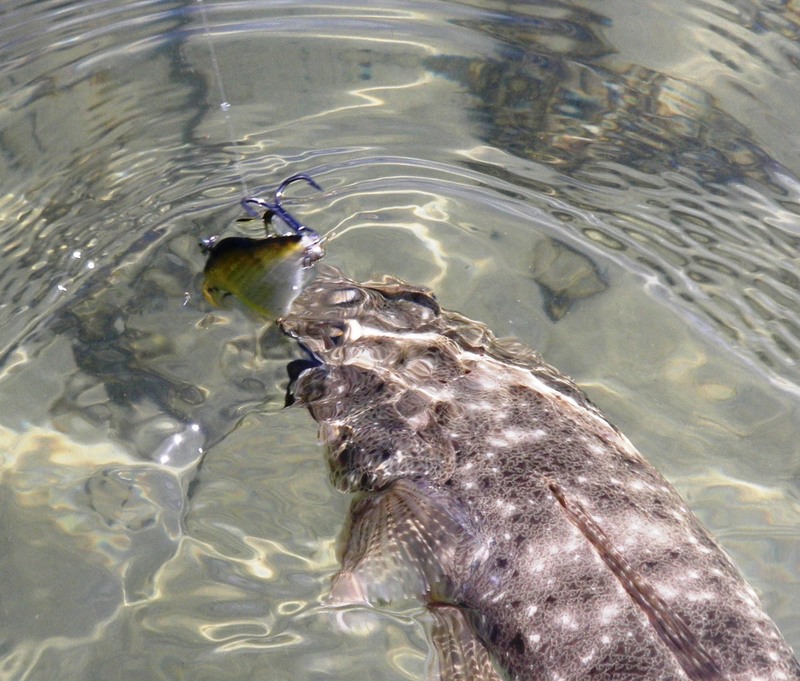 This lure casts like a bullet but also keeps its head down on a long retrieve – this is great when you don’t want to get too close to the area you are fishing. After a couple of casts it was hit, but the angry fish shook the trebles free after a couple of lunges. A few metres further upstream, I caught another and this time it stayed hooked. It was only a small fish but the DUO lure had proved itself again. If you are interested in these lures, they are distributed by http://www.swldistributions.com.au – visit the website for more information. I Caught a few more undersized Flathead on the Yurameki. I then decided to try another of my recent favourites – the CULTIVA Miravibe. This lure is made by Owner and is another great sinking bibless vibe. It has a tight action, but does tend to rise up if worked too fast. It also has no action if worked too slow. It can often provoke a strike when the plastics are not working and after about five casts, I was onto a fish. 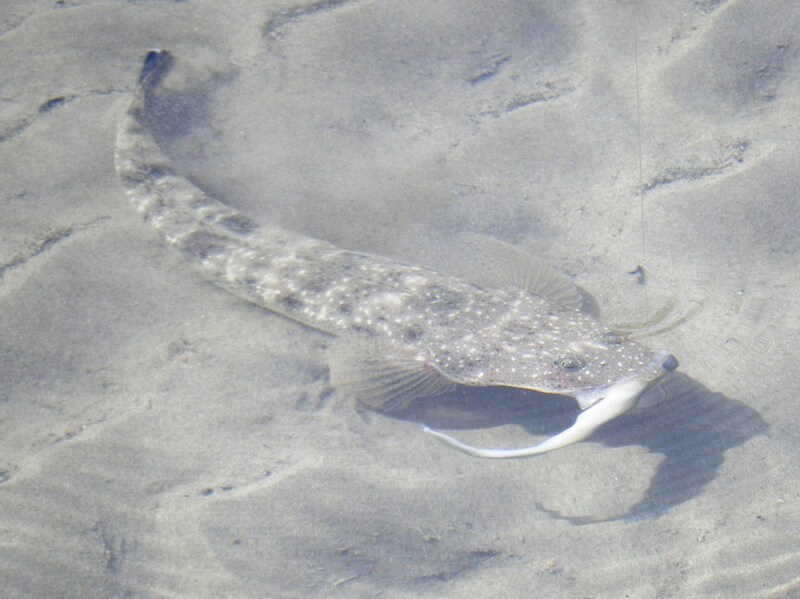 It was the best of the day – after more than 20 fish, I finally had a Flathead over 40cm long. Given how long it had taken to find it, I did not fancy my chances of getting another, so I released it. There had been no big fish but as long as you are catching something, you can’t complain. I had explored a new spot and I am sure that the bigger Flathead will be lurking round there somewhere. I will definitely be back. 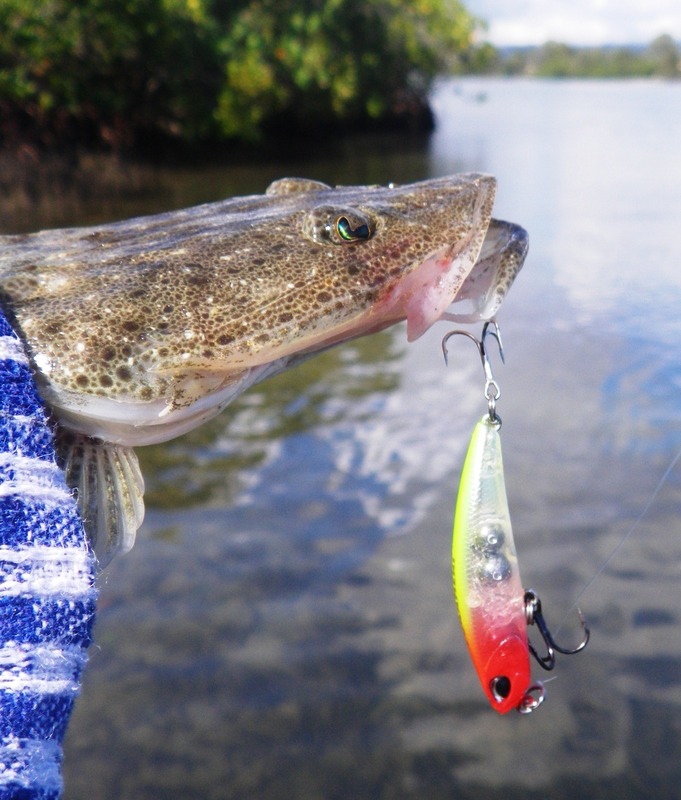 This entry was posted in Fishing Reports, Tweed River and tagged DUO TETRAWORKS YURAMEKI, landangler. Bookmark the permalink. I’ve never found the big fish in that part of the world. I went through a phase of saltwater fly fishing around there. I got plenty of flathead on fly, but they were all under 40cm. I kept expecting to find some bigger ones, but it just never happened. What Plastics would you recommended for me to buy for the tweed river? Plastics work well for me. Going for a fishing trip there soon. Great articles by the way. Love the articles because they give people like me valuable info. Would Squidgy fish and Wrigglers work. In what colour? They do work – no doubt they catch fish, but I think they are generally not quite as effective as the GULP range. I think the GULP scent and soft texture gives them an edge. Anything in a fairly natural colour is always a good starting point. Think I might get both Gulp and Squidgies. See what the fish prefer.